The tweeter is the pride of the system. It is an AMT (air motion transformer). These are used in high end home systems but have never been used in car audio. They will play up to 40k which I know you can not hear with the human ear but it is said to cause the system to sound more accurate in the fact that in real music there are frequencies above 20k, even tho you can't heat them they give depth and with. Something you can not so much hear as sense. While I certainly don't buy in to much of their marketing nonsense, I am interested to hear peoples thoughts on these once they've had a chance to give them a good listen. I look forward to seeing what you think after you get them installed. I'd be curious to hear the midrange on this set. I was about to pull the trigger on the PC3.65 set based on the midrange alone. I hope this new set is an all around great performer and not just a good tweeter. Looks like a high end set though, those cones look very nice. But never been packaged in a car audio set, yes. Anxious to hear your report on these! Glad to see PPI working on the Aesthetics. it's not my call, but I would rather pay 515 bucks for the addition of cast frame midranges over the 500 on stamped steel, but that's just me. I don't know about that ring of what looks like plastic covering the space where the voice coil former attaches to the cone, as being of any benefit other than enhanced aesthetics, but I am pretty sure you could fudge up a speaker with the wrong filler material. they look good, they got a good company name on 'em and I'm sure people will dig on that punchy tweeter. Where are you at in Arkansas? 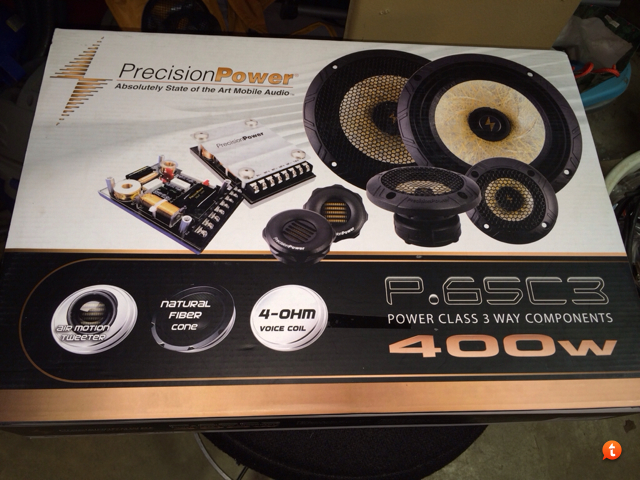 I'd love to give this set a listen once you get them installed and dialed in. Eager to read the results and opinions; I have the previous gen currently, and I'm pleased as punch with them. I really like the tweeter mounting. You guys will love the tweeter. I replaced Scan Illuminators with some and never looked back. I'm in the Little Rock area towards Lake Maumelle. You ever in Little Rock? So whos AMT is it? OK got the set for my wife's car installed, still have to play with the mids to get them mounted correctly and get the moles plugs on the tweets. All I can say is holy crap these are smooth. The highs are crisp. I thought the mids were slightly lacking but we had turned them down on the HU for the old ones. So much smoother than the last generation of PPI 3ways. I am still on the old tune and can't wait to here them when properly tuned. I can tell I need to change the cover points between the mid bass and mids. I was getting ready to pull the trigger on the old set until I saw these on the net last night. I''ll be checking in to see your review. How big is the tweeter and does it have any other mounting options? Looks pretty large to mount in an a-pillar. It fit perfectly where the old tweeter was. Your right, it looked huge. I kept thinking I was going to have to enlarge the hole but it's the same size and their older one. Outside dia without grill 3 1/2"
Outside Dia without grill appx 6 1/2"
Outside dia with grill appx 6 5/8"
Is the mounting depth the same as well? Thanks. What kind of car are they installed in, factory 3-way? I have a DEQ 8 so I am running all active so I didn't get to try the crossovers.